An action outreach of the Word In Action Ministry. As a lawyer who personally discovered the power of the risen Christ, with God's Word, much prayer and counsel, the Ecclesiastical Court of Justice & Law Offices (ECJ) was established in 2001, after God's Word spoke to my heart in accordance with The Holy Bibles mandates as contained in 1 Corinthians 6: 1-9 1 ; and supported by Public Law 97-280 2 of October 1982 when Congress, by passing a federal law, declared that the Holy Bible is the Word of God; locally, Article 1, section 11 of the Constitution of the State of Washington 3 which guarantees that people have an absolute right to the freedom of religion in conscience, practice, and belief; and, of course, the 1st Amendment 4 to the United States Constitution 5 that declares that Congress shall make no law to respect the establishment of religion nor prohibit the free exercise thereof, usually termed as the Establishment Clause and the Free Exercise Clause. 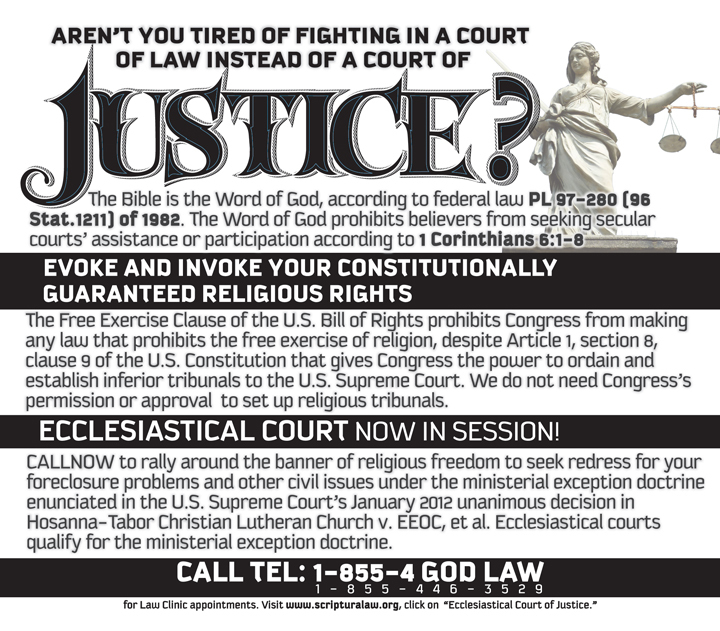 The concept and the practice of an ecclesiastical church court is not new, the Presbyterian Church, the Methodist Church, and the Catholic Church have their own ecclesiastical courts in America. ECJs primary objective is to be obedient to God's Word and to galvanize the jurisdiction of the church, and ensure that its sovereignty and autonomy, as guaranteed by the supreme law of the land, is observed, and adhered to, without doubt, distortion, misinterpretation, uncertianity, and needless confusion. ECJ is usually called upon by local churches to adjudicate and resolve disputes between believers and those that are occasioned between believers and non-believers. These disputes range anywhere from marriage, divorce, property and other issues. Public Law 97-280 - "Year of the Bible"
"That the government, whether local, state or federal, has no business in the business of the church, and these laws clearly, coherently, and cogently state that government cannot, should not, and ought not to interfere, intercede, intrude, or invade the sanctitiy of the church, and it's associated religious organizations." This is the primary reason why we have a law school based on the premise that the Holy Bible is the original source of all law. Suitably qualified individuals can be trained in this law school to earn a fast-track law degree to blaze the trail for the first of it's kind Ecclesiastical Bar Association. While the enemy advances his cause, the Church slumbers... The article quoted below is from a prominent secular law journal. The president of the Lesbian, Gay, Bisexual & Transgender Law Association (LeGaL) has resigned over comments he made to the press about a Sullivan & Cromwell associate's sexual-orientation discrimination suit against the firm. A few days after Aaron Charney filed his Jan. 15 complaint, John Scheich, then-LeGal's vice president, told ABC News that the firm had been a strong supporter of gay lawyers and said: I don't know Aaron Charney or the details of his case, but if I had to line up on one side or the other, I would have to line up with ... Sullivan Cromwell."" The propriety of Scheich's comment had been criticized by gay groups and on the Internet, particularly at legal gossip blog Above the Law. In a statement issued late Thursday, Scheich said he disaffirmed his statement to ABC and apologized to Charney. "As a former litigator I should have known better," he said. "The plaintiff should be given every opportunity to prove his case and should not be prejudged simply because I knew more about the defendant than I did him." Scheich, who was only elected president of the organization several days ago, said he was resigning because the controversy was damaging LeGal. Charney's suit claims several Sullivan & Cromwell partners discriminated against him because he is gay and retaliated against him when he made an internal complaint. The firm has categorically denied the allegations. I've heard it said... "Where there is the most darkness, there is the need for the most light." The Church needs to be the tool used by God to shine the light of His Truth and Justice in every area of our culture - including the area of law. An Ecclesiastical Bar Association is needed NOW! Please look over the law school Syllabus. The salt needs to get out of the shaker. If you think it really doesn't matter, read below what the United States Supreme Court had to say about homosexuals joining law schools to become professional attorneys in Romer v. Evans, 517 U.S. 620, 628 (1996). "When the Court takes sides in the culture wars, it tends to be with the knights rather than the villeins - and more specifically with the Templars, reflecting the views and values of the lawyer class from which the Court's Members are drawn. How that class feels about homosexuality will be evident to anyone who wishes to interview job applicants at virtually any of the Nation's law schools. The interviewer may refuse to offer a job because the applicant is a Republican; because he is an adulterer; because he went to the wrong prep school or belongs to the wrong country club; because he eats snails; because he is a womanizer; because she wears real-animal fur; or even because he hates the Chicago Cubs. But if the interviewer should wish not to be an associate or partner of an applicant because he disapproves of the applicant's homosexuality, then he will have violated the pledge which the Association of American Law Schools requires all its member-schools to exact from job interviewers: "assurance of the employer's willingness" to hire homosexuals. Bylaws of the Association of American Law Schools, Inc. 6-4(b); Executive Committee Regulations of the Association of American Law Schools 6.19, in 1995 Handbook, Association of American Law Schools. This law-school view of what "prejudices" must be stamped out may be contrasted with the more plebeian attitudes that apparently still prevail in the United States Congress, which has been unresponsive to repeated attempts to extend to homosexuals the protections of federal civil rights laws, see, e.g., Employment Non-Discrimination Act of 1994, S. 2238, 103d Cong., 2d Sess. (1994); Civil Rights Amendments of 1975, H. R. 5452, 94th Cong., 1st Sess. (1975), and which took the pains to exclude them specifically from the Americans With Disabilities Act of 1990, see 42 U.S.C. 12211(a) (1988 ed., Supp. V)." ECJ conducts it's business at the 75th Floor of the Columbia Tower Building in downtown Seattle, Washington. Telephone 206-384-9220 if you have any questions. ECJs lawbook is the Holy Bible. Disputants appearing in this court are given every opportunity to state their grievances in the presence of a selected jury. The law of the land will be adhered to provided it does not conflict with biblical principles and mandates. Be blessed as Jesus the Risen Christ is always in charge. Secular law seems to favor the fact that only rights can be enforced. Immunities, privileges, and powers, on the other hand, can only be protected. We can only turn to God, the Holy Spirit and to our Lord and Savior Jesus Christ, for wisdom, inspiration and revelation in times of difficulties in adjudging cases and causes that come before this Court. 1 Corinthians 6: 1-8 is one of the many sources responsible for the establishment of this Court wherein Gods Word stipulates that we need to exercise our ecclesiastical right to address and seek redress to disputes among those who come under the authority of the Church and its jurisdiction. "Congress shall make no law respecting an establishment of religion, or prohibit the free exercise thereof". The First Amendment was placed in the Bill of Rights to keep the church out of governmental affairs, not to keep government out of church affairs  read "The Mind of the Founder", edited with introduction and commentary by Marvin Meyers from "Sources of the Political Thought of James Madison, Brandeis University Press, Hanover and London. "one that involved the high enterprise of translating worthy principles into working laws and institutions with the materials imposed by history". "that a page of history is worth a pound of logic". It must be remembered that, out of the fifty-five Christian Framers of the federal Constitution, twenty-nine were Anglicans, eighteen Calvinists, two Methodists, two Lutherans, two Roman Catholics, one Quaker sometime-Anglican, and one open deist  Dr. Franklin, from twelve states of the then Union. "Year of the Bible in recognition of both the formative influence the Bible has been for our Nation, and our national need to study and apply the teachings of the Holy Scriptures"
"Absolute freedom of conscience in all matters of religious sentiment, belief and worship, shall be guaranteed to every individual, and no one shall be molested or disturbed in person or property on account of religion..."
Clarification must be made that when and where practical the Court may turn to secular references to the extent that the Divine operates in the secular realm to accomplish a Divine purpose in the physical secular realm. You shall do no injustice in judgment; you shall not be partial to the poor or defer to the great, but in righteousness shall you judge your neighbor". "[O]ver-emphasis on certainty may lead us to intolerable rigidity. Justice is a concept by far more subtle and indefinite than is yielded by mere obedience to a rule. There is no solid land for fixed and settled rules. No doubt the ideal system, if it were attainable, would be a code at once so flexible and so minute, as to supply in advance for every conceivable situation the just and fitting rule. But life is too complex to bring the attainment of this idea within the compass of human power". Do you not know that the saints will judge the world? And if the world will be judged by you, are you unworthy to judge the smallest matters? Do you not know that we shall judge angels? How much more, things that pertain to this life? But brother goes to law against brother, and that before unbelievers! No, you yourselves do wrong and cheat, and you do these things to your brethren!